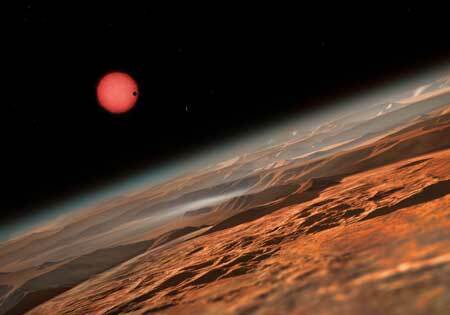 (Nanowerk News) A team of astronomers led by Michaël Gillon, of the Institut d'Astrophysique et Géophysique at the University of Liège in Belgium, have used the Belgian TRAPPIST telescope  to observe the star 2MASS J23062928-0502285, now also known as TRAPPIST-1. They found that this dim and cool star faded slightly at regular intervals, indicating that several objects were passing between the star and the Earth . Detailed analysis showed that three planets with similar sizes to the Earth were present. Michaël Gillon, lead author of the paper presenting the discovery ("Temperate Earth-sized planets transiting a nearby ultracool dwarf star"; pdf), explains the significance of the new findings: "Why are we trying to detect Earth-like planets around the smallest and coolest stars in the solar neighbourhood? The reason is simple: systems around these tiny stars are the only places where we can detect life on an Earth-sized exoplanet with our current technology. So if we want to find life elsewhere in the Universe, this is where we should start to look."